Join us for the 2019 CRYSC Icebreaker Tournament March 1-3 at Gates Soccer Complex and Aurora Sports Park. The tournament is open to competitive & recreational teams 11U-15U Boys & Girls teams and 16U-19U Boys teams. Over 250 teams came out and participated in last year’s competition. Dear Icebreaker teams, We regret to inform you that due to forecasted weather and current field conditions, the Icebreaker Tournament will be canceled. Your team’s safety is of utmost importance to us and after numerous conversations with the folks at the National Weather Service and 9News over the past several days, we are confident that this is the best decision for our teams and their families. Current predictions show temperatures dipping below playable conditions Saturday morning, four to eight inches of snow accumulating Saturday afternoon and freezing temperatures on Sunday. We understand that many of you made travel and lodging plans, but the forecast as it stands now does not lend itself to a pleasant and safe experience. We will immediately begin the process of providing refunds to all accepted and scheduled teams. If you have questions or concerns please contact tournaments@rapidsyouthsoccer.org. We offer a three game guarantee for all teams. All teams who meet the age and qualification criteria are invited to join. We have teams from all over the Rocky Mountain region and welcome teams from out of state as well. 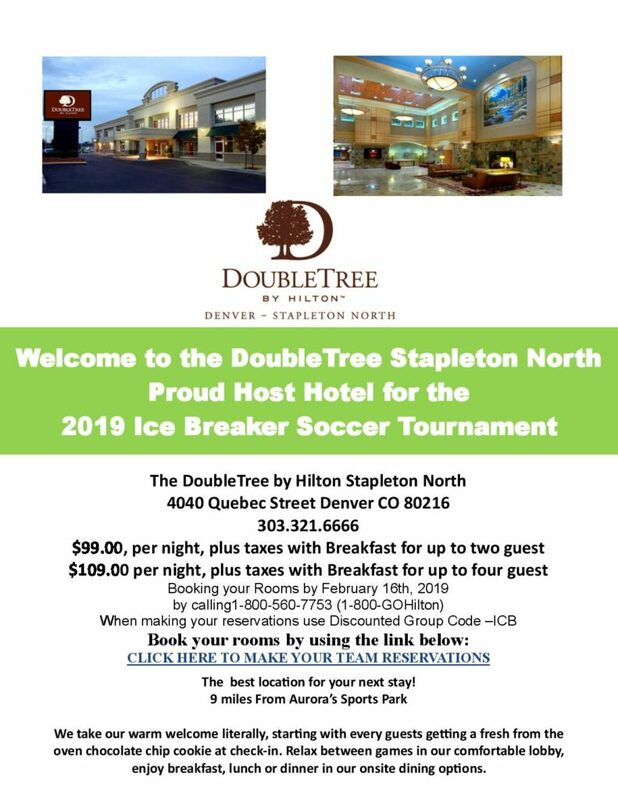 Start your Spring season with Rapids Youth Soccer at the new and improved Icebreaker Tournament. The Icebreaker’s registration is now open and closes February 16th. The tournament is open to competitive and recreational teams 11U-15U boys and girls and 16U-19U boys only. Roster sizes should not exceed 16 for 11U/12U age groups and no more than 18 for 13U and above. Each team is allowed up to 5 guest players. Every competitive team 11U – 19U is required to provide a state sanctioned roster. Every recreational team 11U-19U is required to provide a copy of the roster from the home club. All teams are required to bring player passes, including guest players. All teams are required to bring an official guest roster. Template can be found here. All competitive teams must supply to the tournament medical release forms for all players. Medical release form can be found here. For teams coming from outside Region IV, and out of state guest players, must have official permission from the home state sanctioning body to participate in the Icebreaker Tournament. For a tournament in progress (dates of planned event), in the event of rain, snow or acts of God, the tournament director reserves the right to reduce game times and numbers of games. If only 2 games are played a 30% refund is given. If only 1 game is played a 60% refund is given. If a tournament is canceled by the host prior to the date of the event a 80% refund is given. the team withdrew to play in another tournament. When does registration open and what is the registration deadline? When will teams be notified if they are accepted? Teams will be notified of acceptance three weeks before the tournament date. Check-in will take place Thursday night prior to the tournament weekend from 6:00pm-8:30pm at The Eddy 111 Havana St. Ste. #120 Aurora, CO 80010. When will schedules be posted? Schedules will be posted two weeks prior to the event. What is the point system for this tournament? Minus two (-2) points for a forfeiture or abandonment of a game. For U11-U18 matches a minimum of seven (7) players constitutes a game. Games should start at the given start time. In case the team does not have seven (7) players present, there will be a maximum of five (5) minutes grace period before awarding the game to the opponent. A forfeit will be scored 3-0. How can I find out the scores and standings? All scores are entered and updated immediately online as soon as game cards are received. The scores for the final game of the day will be entered within 2 hours of the score being received. All flights and playoff games for day 2 of the tournament will be updated online 2 hours following the final game on day 1. The website will be the most up-to-date and accurate information for scores and standings. Will there be finals for all flights? All teams are guaranteed at least three games, weather permitting. Bracket size for each age group will determine format finals and consolation where applicable. Single age brackets will be used where possible. The tournament committee will determine brackets.